Last Sunday was the final day of the Alexander McQueen “Savage Beauty” exhibit at the Met Museum. I woke up that morning ambivalent if I should take the 1 hour trip to NYC and wait on a 5 hour line to see the exhibit. It didn’t take long for me to realize that there was no way I could miss this final opportunity to witness first hand the legendary clothes that McQueen poured so much of his life, heart and soul into. The exhibit was breathtaking in every sense of the word. The show opened with two gowns one blood red and the other pure white. The red gown was made of red and black ostrich feathers with tiers of glass medical slides painted red to look bloodlike. The white dress was made of white sea shells. As I made my way through each room I was memorized with what I saw as each piece in the exhibit was so intricate, complex and beautiful just like the designer himself. Many of McQueen's quotes were written on walls in the exhibit but one in particular stood out. "I oscillate between life and death, happiness and sadness, good and evil," he once said. The exibit was a celebration of his life and the life he poured into his clothes which will live on forever as his legacy. 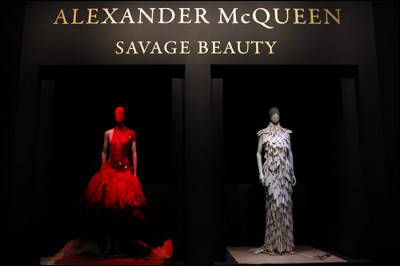 Check out the full video of the Alexander McQueen "Savage Beauty" exhibit below.